Aomori apples have a history going back over 120 years. Photo Courtesy of Aomori Prefectural Website. Although small, wild apples have existed in Japan since the early 10th century, the cultivation of what the Japanese today know as apples began in 1871 when the Meiji government launched experimental farming with American varieties. The prefectures of Aomori, Nagano, Hokkaido, Iwate, Yamagata, Akita, and Fukushima became the major centers of production. The American Methodist missionary John Ing (1840-1920) also played a crucial role in introducing apple seedlings from the United States to Aomori. After World War II, vigorous efforts in cross-pollination and breeding resulted in the development of the Fuji variety in 1962. 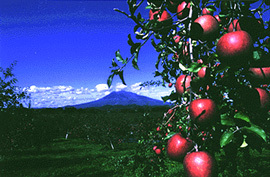 A cross between two American varieties, Fuji is now widely grown in the United States, signifying the return of the Japanese apple to its original home.